1. Place the glutinous rice flour in a big bowl. Add water bit by bit and knead until it forms a smooth dough. Divide dough into 2 portions. Colour 1 portion of dough with the red food colouring and knead till the dough is evenly coloured. 2. Divide both white and pink doughs into 1.5 cm portions and lightly roll them into balls between the palms. Set aside. 3. Bring 1.5 litre water to a boil. Add the ginger and pandan leaves and boil for 10 to 15 minutes over medium heat. Add sugar and boil till sugar dissolves, remove pandan leaves and ginger. 4. In another pot, bring 1 litre of water to a boil. 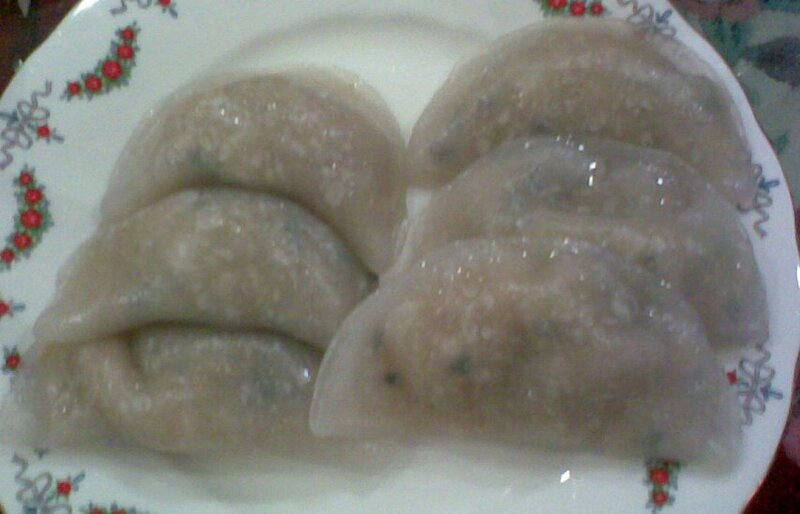 Drop in the glutinous rice balls and let them boil till they float to the surface. Transfer them with a slotted spoon into the ginger syrup. 5. Drop the coloured tapioca flour cubes into the boiling water and boil till they float to the surface and are cooked through. Remove and drop them into the ginger syrup. 6. Ladle the glutinous rice balls and tapioca cubes together with the ginger syrup into bowls and serve. 1. Peel and cut sweet potatoes into chunks. Wash and flatten ginger with the back of a cleaver. 2. Place 2.5 litres of water in a pot together with the ginger and pandan leaves. Bring to a boil. 3. Add in the dried longans, sweet potatoes and rock sugar. Simmer for 15 to 20 minutes or until the sweet potatoes are just tender. 4. Discard pandan leaves and serve. 1. Boil the brown sugar and 50ml water till sugar dissolves. Strain and leave to cool. 2. Pound the pandan leaves and extract the juice. 3. Mix the egg with the thick coconut milk and pandan juice. 4. Mix the shifted flour with the cool sugar solution and mix well, then add in the thick coconut milk mixture. 5. Dissolve the double action baking powder with 2 tbsp of hot water and add to the mixture. 6. Pour mixture into small containers and steam immediately for about 20 minutes. Method: Mix dissolved yeast with the plain flour and water and leave to rise for 5 to 8 hrs. 1. Sieve plain flour and tapioca flour together into a mixing bowl. 2. Add in the sugar, bicarbonate of soda, alkaline water and eggs. 3. Add water gradually and stir until combined then add risen dough and mix well. Cover and keep batter aside for 1-2 hours. 4. 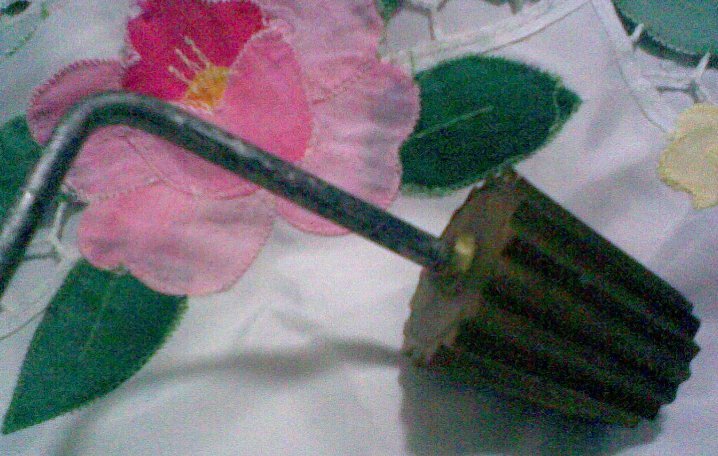 Heat a brass mould or a non-stick pan. Pour a thin layer of batter onto heated, greased mould and spread batter to form a round thin pancake. Sprinkle with a bit of sugar, cover and cook over medium low heat until cooked. 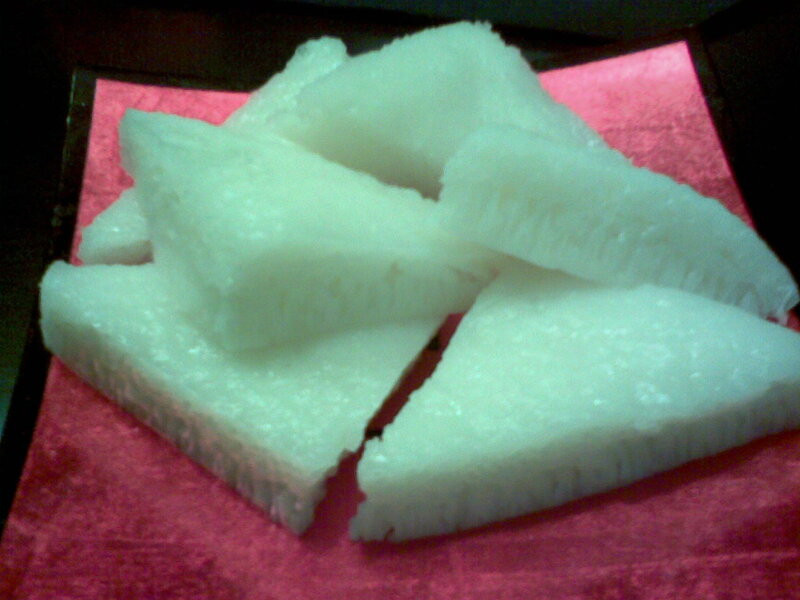 Sprinkle with coconut or peanut fillings, fold kueh over and remove from mould. 1. Remove skin of sweet potatoes, wash and cut into pieces. Boil with some water till cooked, drain and mash till fine. 2. Pound pandan leaves and extract the juice. 3. Sift flour into a mixing bowl, add the brown sugar and mix thoroughly. 4. Add the pandan juice and cooled, mashed sweet potatoes. 5. Add in the water bit by bit till enough to form a thick batter. 6. Dissolve the dried yeast in 2 tbsp lukewarm water, leave till foamy then mix with the batter. Mix well, cover and leave to prove for 1 hour. 7. Pour batter into 2-5″ round tins lined with banana leaves and steam over vigorously boiling water for 1 hour. 1. Sieve rice flour into a mixing bowl. Add in the salt, 600ml water and the alkaline water and mix well. Rest mixture for 10-15 mins before straining. 2. Boil remaining 600ml water. 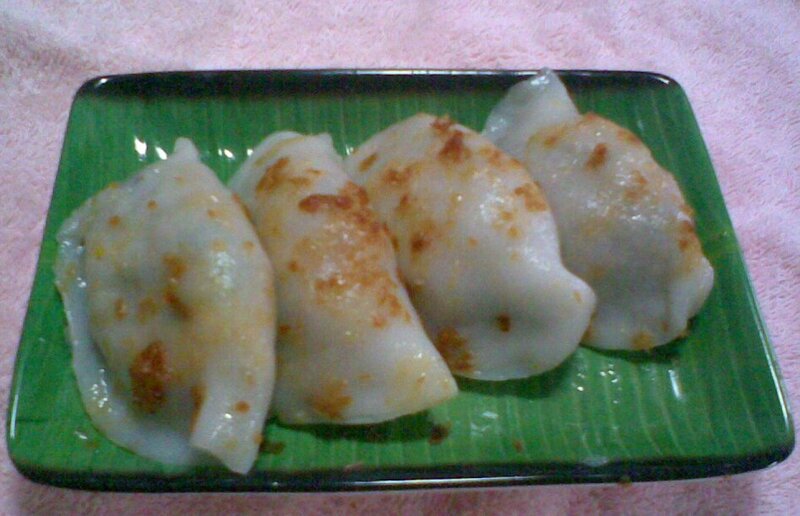 When boiled, pour the rice flour mixture into it and stir till thick. 3. Line a 9 inches round tray with cellophane paper. Pour the rice flour mixture into it and smoothen the surface with 2 tbsp water. Steam over high heat for about 1/2 hour or till cooked. 4. 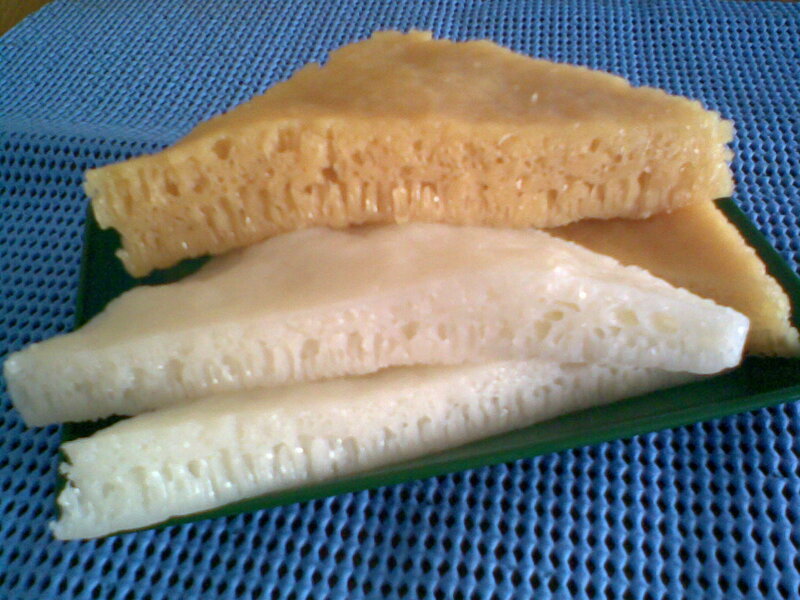 Cool kueh before cutting into serving pieces. 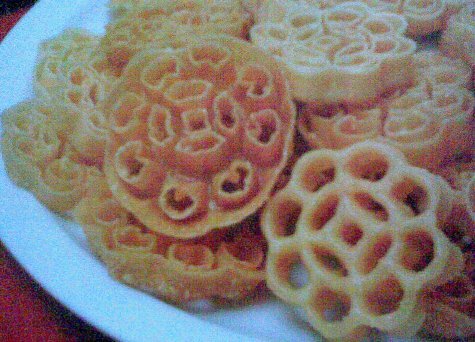 Serve with palm sugar syrup. 1. Boil the above ingredients together until thick. 2. Remove pandan leaves and sieve. 1. 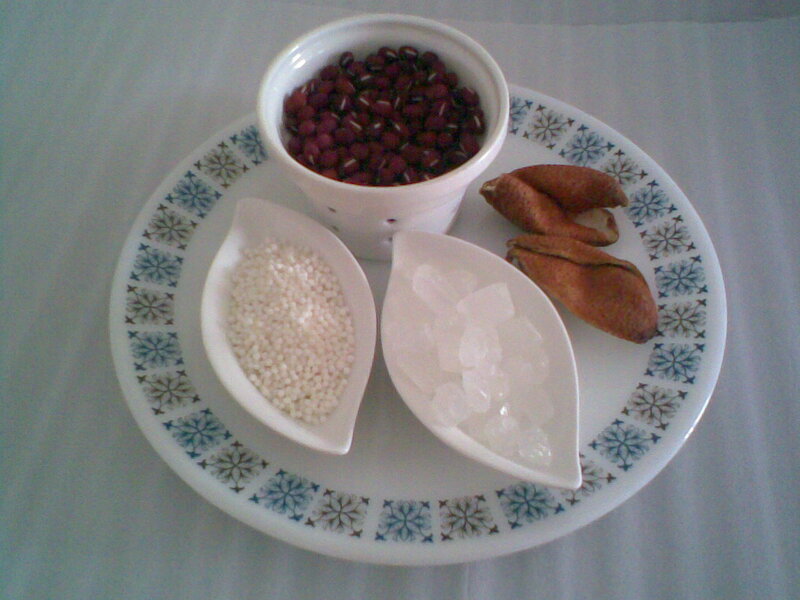 Wash red beans in several changes of water and remove any grit that rises to the surface. Rinse and drain. Rinse tangerine peel briefly. 2. Bring 2.5 litres of water to a boil. Add the red beans, pandan leaves and tangerine peel and boil over high heat for 15 minutes. Lower heat and simmer for 1 hour till beans are softened. Remove half of beans and blend till fine. 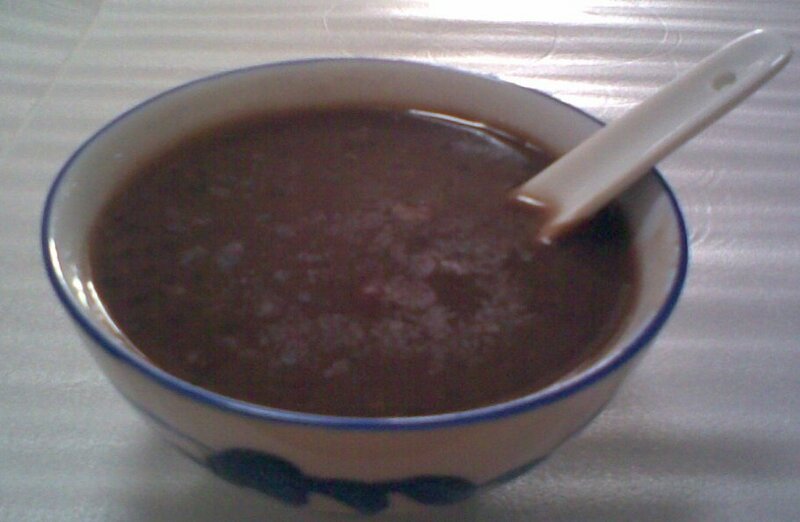 Pour blended bean paste back into pot. 3. Add rock sugar and continue to simmer over low heat for another 1/2 hour. Add sago and boil until sago turns translucent. 1. Sift flour onto table, add water gradually and knead into a smooth dough taking about 20 minutes. 2. Place dough into an oiled container, cover with a piece of damp cloth and put on the container lid. 3. Set aside for 48 hours for dough to ferment. (Dough will take a longer or shorter time to ferment depending on weather conditions). The dough is ready for use when it turns sourish. 1. Dissolve bicarbonate of soda in 125ml water and add to yeast dough. Add sugar and alkaline water and knead for 5 to 10 minutes. 2. Add sifted flour and knead well. Sprinkle top with some flour and cover with a piece of damp cloth. Set aside to proof for one hour or longer. 3. Sprinkle some flour on table top. Roll out dough into a rectangular sheet. 4. 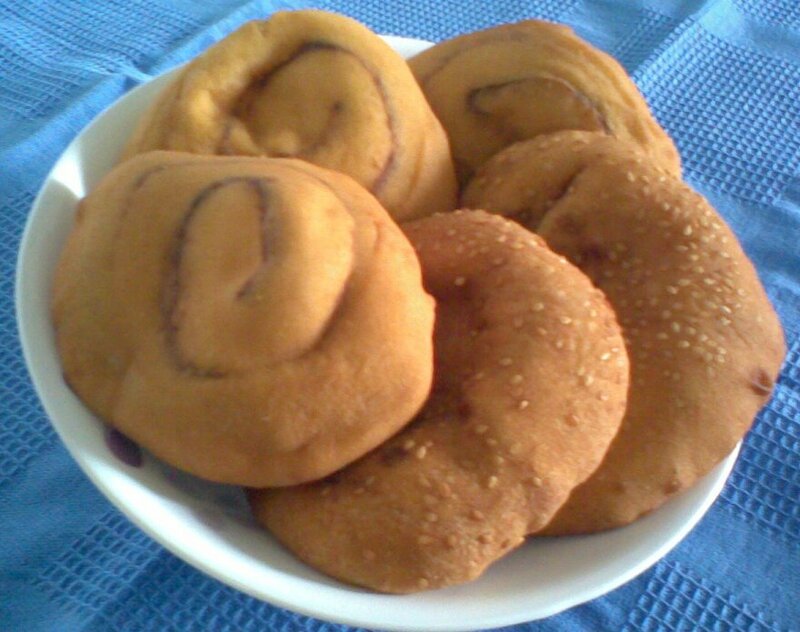 Sprinkle some five-spice powder and salt over dough. Dip brush in some water and brush over mixture lightly. 5. Roll dough up like swiss roll and cut into 2.5 cm slices. Flatten each piece into a thin round shape with a wooden roller. 6. Deep fry in hot oil till golden brown. Drain off excess oil on absorbent paper. 1. Sift flour with salt and pepper. 2. Slowly mix in the water and melted butter and mix well into a smooth batter. Sieve batter and let stand for 1 hour before use. 3. Heat oil in a small deep pot for deep-frying. 4. Dip a medium-sized pie tee mould into the boiling oil, remove it and dip mould into the batter covering only about 3/4 length of the mould. 5. Deep fry the pie tee cases in the hot oil until set. Shake off the pie tee case from the mould and fry until light brown in colour. 6. Drain pie tee cases on absorbent paper and cool thoroughly before storing in an airtight container. 7. To serve, put a small piece of lettuce into a pie tee case. Add a tbsp of filling and top with coriander leaves, prawn, crab meat, egg shreds, sliced red chilli and pounded peanuts. 8. Serve with chilli sauce. 1. Peel carrot and turnip and cut into thin strips. 2. Heat 2 tbsp oil and fry the ground garlic and shallots. Add taucheo and stir-fry until fragrant. 3. Add shredded carrot and turnip and fry well, adding a little water. Simmer over low heat until cooked. Add seasoning and adjust according to taste. 1. Beat eggs with water and a pinch of salt. Heat 2 tbsp oil in pan and fry beaten eggs to egg sheet and slice fine. Mix all ingredients together and add salt and sugar to taste. 1. Beat eggs with sugar and salt until light and fluffy. 2. Fold in flour sifted with baking powder and pepper powder. 3. Pour a thin layer of batter into greased patty tins and place 1 tsp meat filling in the centre. Cover with another layer of batter and top with a parsley leaf. 4. Bake in a moderate oven at 180 deg C for 25 – 30 minutes. 1. Heat oil and fry chopped onion and ground garlic until fragrant. 2. Add minced meat, seasoning and plain flour and fry until cooked. 1. Boil sugar with agar agar powder and 500ml water till agar agar dissolves. 2. Add in mango juice, fresh milk and vanilla essence and stir well. 3. Pour into a rinsed mould to set. Chill pudding before serving. 1. Mix rice flour, tapioca flour, salt, pepper and oil with 750ml water and leave to soak for 4 hours. 2. Pour all ingredients into a wok and stir continuously over a slow fire until cooked. Remove dough onto tabletop and add in a bit of pink colouring. Sprinkle with some tapioca flour and knead well into a soft and pliable dough. 3. Divide dough into small portions. Flatten each portion of dough and wrap with a spoonful of the filling. Press into a mould and gently knock out the kueh and place on a greased steaming tray. Steam over medium heat for 10-15 minutes or until cooked. 1. Soak glutinous rice for 3 hours. Wash and drain rice and put into a tray. Add enough water to just cover rice and steam for half an hour or until cooked. 2. Soak dried mushrooms and cut into strips, wash ‘chai por’ and squeeze dry. Wash dried prawns and drain. 3. Heat some oil in a wok and fry the ‘chai por’, dried prawns and mushrooms until fragrant. Add the boiled peanuts, seasoning and the steamed glutinuous rice and fry till well mix. Leave to cool before use. 1. 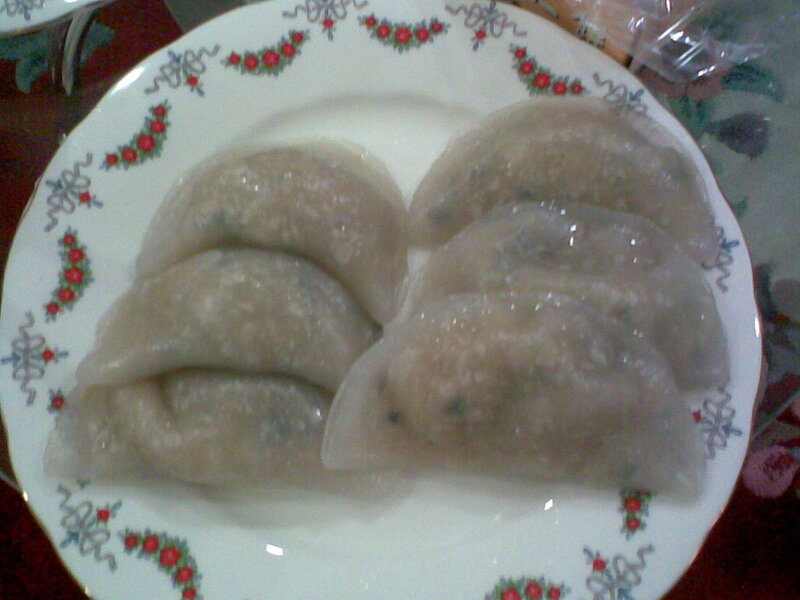 Mix rice flour and tapioca flour with 900ml water. Strain mixture and set aside for 15 minutes. 2. Heat 4 tbsp oil in wok, fry the sliced shallots until golden brown. Remove and set aside for garnishing. 3. In the same oil, stir-fry the chopped dried prawns and sausages until aromatic. Remove half of it for garnishing. 4. Add pork and mushrooms and stir-fry for a while. Add in the yam cubes, seasoning and some water and let simmer for a while. Dish up and set aside. 5. Boil the remaining 900ml of water with 1 tsp salt. When water is boiling, turn off heat immediately. Add in the mixture from (4) and the flour solution and keep on stirring till mixture becomes thick. Pour batter into a greased 23cm steaming tray. 6. Steam mixture over high heat for 45 minutes or until cooked. 7. Whilst still hot, spread remaining fried dried prawns and sausages on top. Garnish with chopped spring onions, chillies and coriander leaves. Sprinkle with lightly toasted sesame seeds and fried shallot crisps. 8. 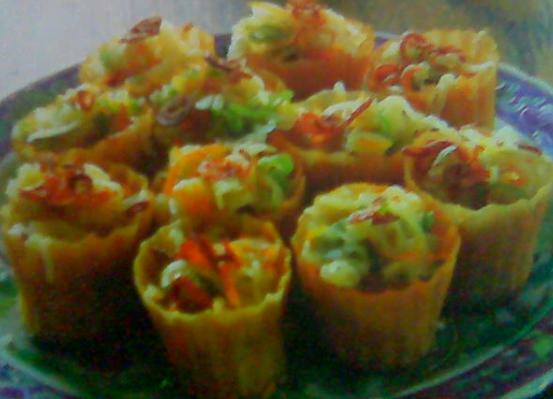 When cold, cut into serving pieces and serve with chilli sauce. 1. Soak dried beancurd skin in water with 1/2 tsp bicarbonate of soda for about 20 mins until soft. Rinse and tear into smaller pieces. 2. 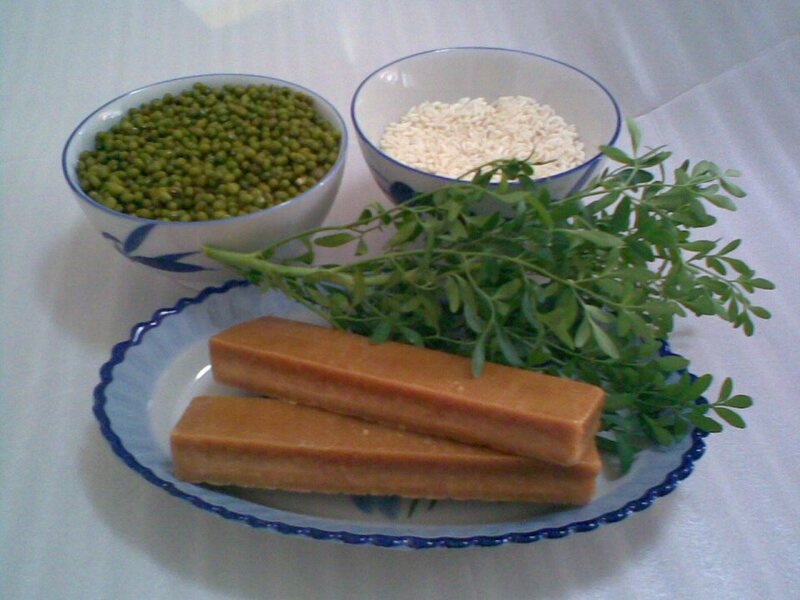 Rinse barley in several changes of water and place in a pot with the water, pandan leaves and beancurd skin. Bring to a boil. 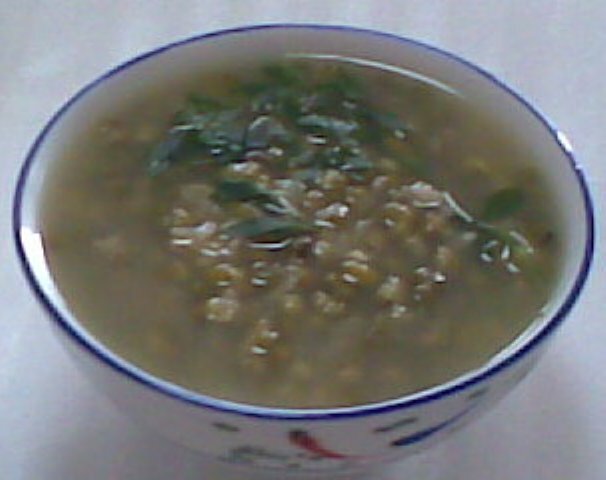 Reduce heat and simmer gently for 30 minutes or until barley grains are tender. 3. Add the gingko nuts and and rock sugar and simmer for another 10 to 15 mins. 4. Beat egg whites lightly until well mixed. Slowly drizzle into pot to form thin strands. Stir well to mix with barley mixture. Serve hot or cold. 1. Sift plain flour and rice flour into a mixing bowl. 2. Stir eggs with sugar and pandan juice till sugar dissolves. Add to the sifted flour and mix well. 3. Add a pinch of salt to the coconut milk and gradually add to flour mixture to form a smooth batter. Batter should be slightly thicker than pancake batter. (If mixture is too thick, dilute with thin coconut milk). Strain and leave to stand for 1 hour. 4. Heat oil in wok until hot. 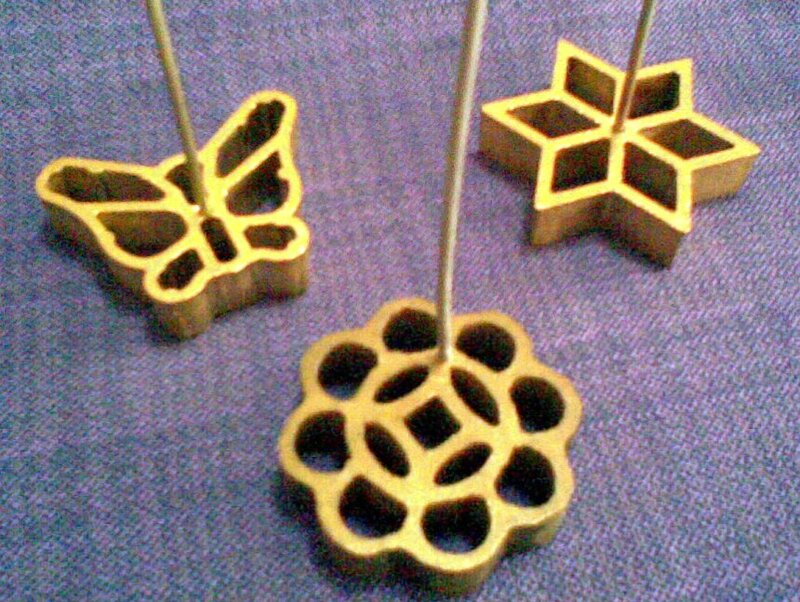 Dip the rosette mould into the oil to heat it. 5. Dip hot mould into well-stirred batter, ensuring that the batter comes slightly above three-quarters of the way up the sides of the mould. Immerse the rosette mould in the hot oil. As is cooks , the batter will pull away from the sides of the mould. Shake mould gently to dislodge rosette and allow it to cook for a few more seconds on medium heat until golden brown. 6. Drain and leave to cool thoroughly before storing in airtight containers. The rosettes will keep for 1-2 weeks. 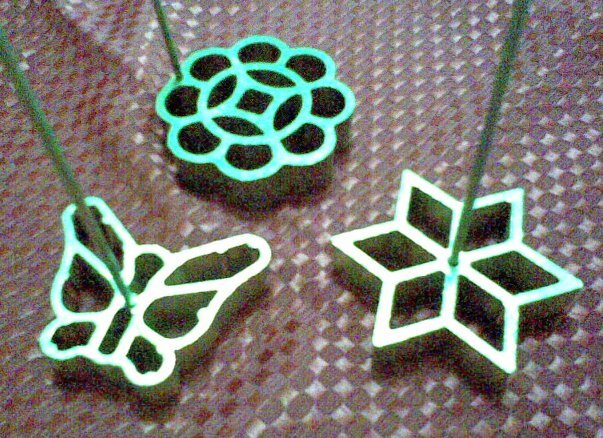 Note: You will need a special rosette mould fixed on a long handle that can be dipped in hot oil. 1. Add 300ml water to the rice flour and mix well. 2. Boil sugar with 300ml water, salt and pandan leaves. When boiling, pour syrup into rice flour mixture. Stir well and strain mixture. Leave aside to cool. 3. Dissolve 1 tsp yeast in 2 tbsp lukewarm water and add to cooled rice mixture. Stir well, cover and leave to leaven for 11/2 to 2 hours till small tiny bubbles appear. 4. Grease and preheat a 30 cm round tray in steamer. 5. Add 1/2 tbsp oil to leavened mixture, stir well and pour into heated tray. Steam for 20 minutes. 1. Beat egg whites till stiff. 2. Bring 1200ml water to a boil. When boiling add in the sugar and gelatine powder. 3. Keep stirring till sugar and gelatine powder has dissolved then add in the coconut milk. 4. Pour mixture into the beaten egg whites and stir evenly with a whisk. Add in the condensed milk and stir well. 5. Place the whole pot of jelly into a bigger pot filled with water and ice cubes. Continue stirring till the mixture combines and set. 6. Chill in the fridge before serving. 1. Place sifted tang mien furn, rice flour and salt into a mixing bowl. 2. Boil the water and when boiled pour into the flour and stir quickly to cook the dough. 3. Transfer cooked dough on to table top and knead until smooth and pliable. Cover dough and set aside for 10 minutes. 4. Roll dough out into a long cylinder and divide into about 30 pieces. Flatten one piece of dough and roll out into a circle. 5. Fill each wrapper with a tbsp of filling, fold into a semi circle and seal the edges by pinching the sides together. 6. Place prepared kueh on a greased steamer and steam over high heat for about 10 minutes. Remove from steamer and brush with some shallot oil. 1. Boil lean pork and cut into thin strips. Fry beancurd cubes till light brown and drain. 2. Wipe chives with a kitchen towel and cut into 2 cm lengths. Toss with a tsp of alkaline water to preserve the green colour. 3. Heat oil in wok and fry the chopped garlic and dried prawns till fragrant. Add in pork strips, fried beancurd cubes and seasoning. Add a bit of water and stir fry till almost dry. Add in the chives and and quickly dish up. Leave to cool before using. 1. Sieve rice flour and tapioca flour into a big pot. 2. Boil 600ml water with salt. When boiled, pour into the flour and quickly stir with a long stick till flour is well distributed and cooked. 3. Pour cooked rice dough on to floured table top. Add in 2 tbsp oil and knead well till smooth, adding more tapioca flour if necessary. Rest dough for 10 minutes. 4. Dip hands with water and knead dough again till smooth and pliable. Cover dough with dry towel to prevent drying. 5. Roll dough out thinly and use a rice bowl to cut out small even pieces of wrapper. 6. Fill each wrapper with 1 tbsp of filling and fold into a semi circle. Seal edges by pinching the sides together. 7. Place kueh on greased steaming trays, sprinkle with some water and steam over high heat for 10 minutes. When kueh puffs up, it is ready. Remove and brush with shallot oil. 8. To serve, sprinkle kueh with fried crispy shallots and dredge with some dark sweet sauce and chillie sauce. 1. Skin turnip and carrot. Cut into thin strips. 2. Heat oil in wok, fry chopped garlics and dried prawns till fragrant. Add in the shredded pork (if used), sliced mushrooms, carrot and turnip strips. Add seasoning and some water and stir fry till turnips are soft and ingredients are almost dry. Dish up and leave aside to cool before using. 1. 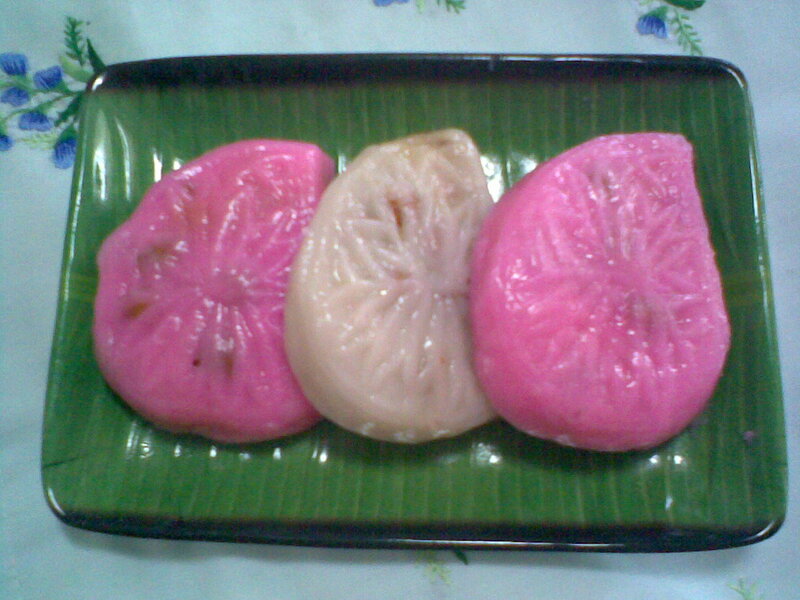 Cut nian gao into 1/2 cm thick slices. (If the cake is too hard, steam whole cake for 5 minutes before cutting). 2. Wash and skin sweet potato. 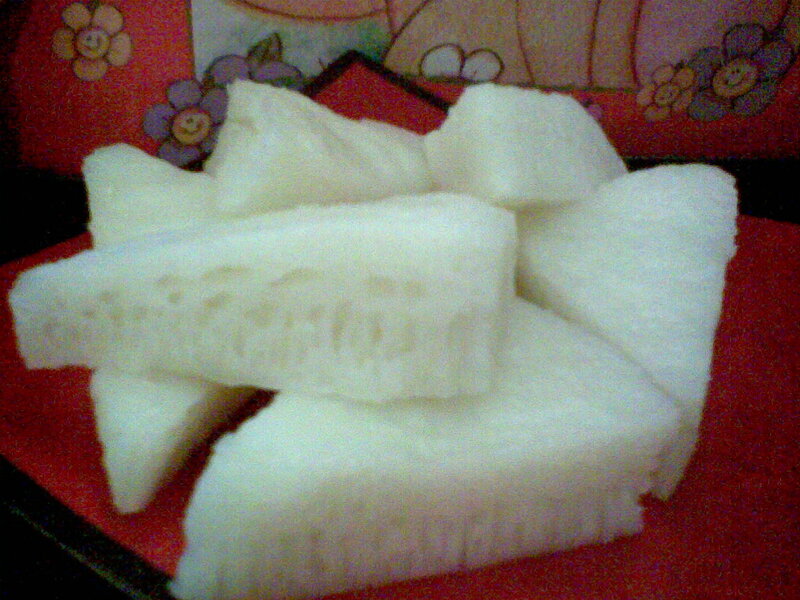 Cut into halves and then cut into 1/2 cm thick slices as for nian gao. 3. Sift the plain flour, cornflour and baking powder into a mixing bowl. Beat the egg with the sugar for 3 minutes and add to the flour. Blend in the water, a little at a time till enough to form a thick-dripping consistency. 4. Heat wok with 3 rice bowls oil until very hot. Lower flame to medium. 5. Sandwich a piece of sweet potato in between two pieces of nian gao. 6. Dip into the thick batter and carefully drop into hot oil. Deep fry on each side for about 5 minutes or until golden brown. 7. Remove and drain off excess oil. 1. Mix green bean flour with water and pandan paste. Blend well until a smooth mixture is obtained. 2. Cook mixture over medium heat , stirring all the time until the mixture thickens and turns translucent. 3. Fill a basin with ice and cold water and set the cendol mould over it. Use a wooden spoon to press cooked dough, a little at a time, through the preforations into the cold water. Drain cendol in a colander and set aside. 4. 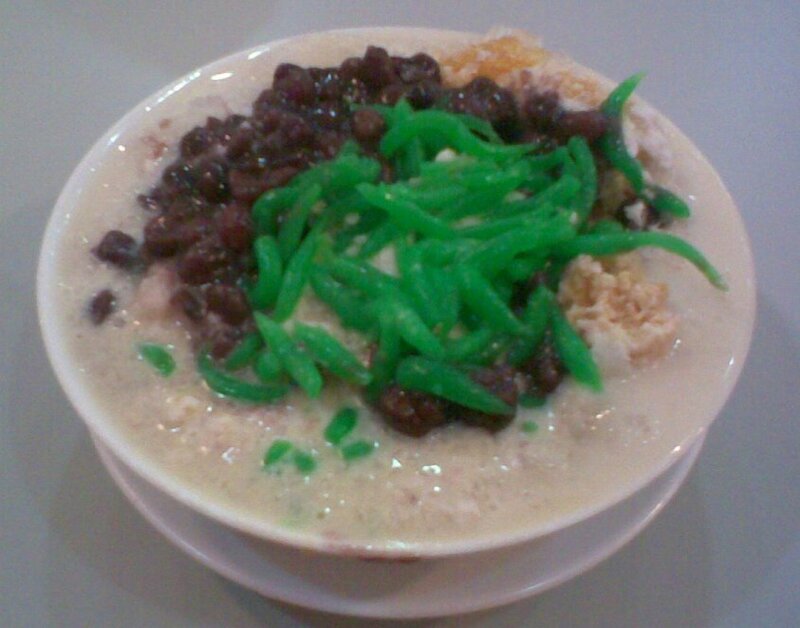 To serve, spoon 2 tbsp of cendol into a bowl, top with shaved ice, chilled coconut milk and 1 or 2 tbsp of gula melaka syrup. 1. Place all ingredients into a saucepan and cook till the sugar dissolves and forms a thick syrup. 2. Remove pandan leaves and strain into a small bowl. Leave to cool. Use ready squeezed coconut milk, add a pinch of salt and chill in the refrigerator. 1. Wash red beans, remove grit and soak in hot water for 30 minutes. 2. Soak raw peanuts in hot water for 30 minutes. Remove skin, wash and drain. 3. Wash pearl sago and drain. 4. Bring the water to a boil. Add in the red beans, peanuts, tangerine peel and pandan leaves. Simmer over low heat for 30-40 minutes until peanuts and beans are soft. 5. Stir in the pearl sago and keep on stirring with a ladle to prevent sago from sticking to the bottom of the pot. Simmer until sago is cooked and turn transparent. 6. Add in the rock sugar and stir until sugar dissolves. 1. Wash green beans in several changes of water. Pick out the grit and discard spoilt beans. Boil beans for 5 minutes, wash and drain. 2. Wash and soak glutinous rice for 1/2 hour. 3. Boil green beans with 1.5 litres of water for 30 minutes or until beans expand. 4. Add in glutinous rice, common rue or pandan leaves and another 2 litres of boiling water. Boil for another 30 minutes or until beans and glutinous rice are cooked. 5. Add in the ‘peen tong’ or rock sugar and stir occasionally till the sugar dissolves. 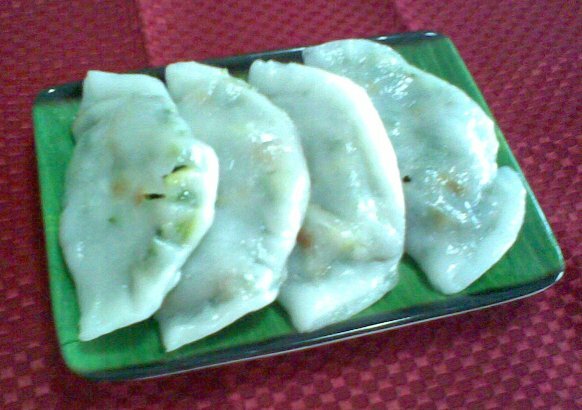 Note: Can substitute 5g common Rue (chow chau) with few pandan leaves. 1. Skin and wash water chestnuts. Smash and chop roughly. 2. Mix water chestnut powder with 500ml water. Stir well and strain mixture. 3. Bring 500ml water to a boil. Add in the rock sugar and stir till sugar is dissolved. Pour hot syrup into the water chestnut powder solution and stir quickly. 4. Add the chopped water chestnuts and the 2 tbsp of oil to the mixture. Cook over low heat, stirring all the time till mixture starts to thicken. Quickly turn off heat and keep stirring the mixture till well combined. 5. Pour into a greased square tin and steam over high heat for 30 minutes. Cool thoroughly before cutting. Chill before serving. 1. Line a round tin with cellophane paper. 2. Beat eggs with sugar till very thick and white. 3. Fold in sifted flour with ice cream soda alternately. Add in sultanas (if used). 4. Pour batter into cellophane-lined tin. 5. When water in steamer is boiling vigorously, place the tin of batter onto the steaming tray. Cover and steam over high heat for 1 hour. Do not lift the lid until the cake is cooked. If you need to top up water in steamer, use hot water. 6. Remove cake and place on a wire rack to cool. 1. Peel apples, soak in salt water for a while. Drain and grate fine. 2. Boil water with the agar agar powder. 3. Stir eggs with sugar and vanilla essence. Add in the grated apples and the evaporated milk and stir well. 4. Pour the egg mixture into the boiling agar agar. Lower flame and stir mixture till thickens. 5. Pour into rinsed mould to set. Cool before chilling in fridge. 1. Mix all the ingredients together, add seasoning and mix well. 2. Shape into bite-sized balls and dust with cornstarch. 3. Heat wok with cooking oil. Deep fry the pork balls until they are brown and cooked. 1. Grate tapioca and drain off yellow liquid. Mix with all other ingredients and blend well. 2. Pour into a 10-inch square tin. Bake in a preheated oven at 180 deg C for 30-35 minutes or until done. 1. Put the coconut milk, evaporated milk, sugar and flour into a saucepan. Bring to a boil, stirring constantly to prevent mixture being burnt. 2. When thicken, add in slightly beaten egg yolk. Cook for 2 minutes. 3. Spread on top of the baked tapioca cake and broil at 180 deg C for 10 minutes or until golden brown.